Updates will be posted on the curse forge page in the downloads area from now on. Stuff and Things is my second mod that adds a bunch of cool stuff to the game. It is currently a WIP and so suggestions are appreciated. I hope you like it! This mod was inspired by the youtuber, sl1pg8r. This mod was designed to add a bunch of things that would be nice to have in vanilla, but isn't there. All of the info on this mod has been nicely compiled into a wiki for ease of use. Now I can keep this page short. Click here for the wiki. Please check it out. It's worth the time. Changelog: 1.0 - Everything not in future updates 1.0.1 - Fixed the bug where some vanilla items would have a different name. 1.0.2 - Fixed the evil server bug! Added sticky pearls. You're welcome, Xisuma! Now I just wanna give a HUGE thanks to GreenConsole. He has helped me out SO much with this mod. He did practically all of the art for it 10 times better than I could have done. If you're gonna say who made it, mention him too. Thanks! I was looking into CurseForge. I might use it later but not for the moment. Coming soon to a minecraft near you: Force field update... beta! Clicky for the "snapshot" video! My username is not player###. The forge dev environment automatically assigns you an player name titled Player### where # is a random number. My real IGN is TheUnlocked. Great mod, wanted to try it on a server pack I'm putting together and unfortunately it caused a crash in Cauldron (formerly MCPC+). Here's the crash report, and the full log. It seems like a very good mod! Have you thought about adding Extended Workbench support with the Amplified Tools and possibly Super Diamond Tools for the Amplified Diamond and whatnot, and can I use it in my modpack? Never seen the extended workbench mod. Link? Yes you can use it in your modpack. If you wouldn't mind, could you tell me where the pack website or whatever is (if there is one)? Interesting. I'm not sure what is going on but from the looks of it, either bukkit or the combination of bukkit and forge don't have some necessary render classes required to make aspects of this mod work. That is what I can tell from the crash report. If you could get someone who really understands those logs (unlike me) to take a look and see if I did anything wrong, I would be glad to help. Unfortunately, I currently can't. I'm not a mod dev so I can't say for sure, but from what I gather anything on a server (regardless of variant) shouldn't reference the client namespace (I don't think it even exists in server jars) and, in particular, shouldn't try to render anything. The old method (sometimes still used) was to release separate versions specifically for servers. These days unified jars seem to be the most common thing to do. Presumably they check whether they're running in a client or server and respond appropriately. Here's a link to the EW mod, and thanks. And it's currently in a closed beta, but here's the thread link to it. EDIT: Found a conflict between your mods! If so, I would guess that it is a conflict with another mod. 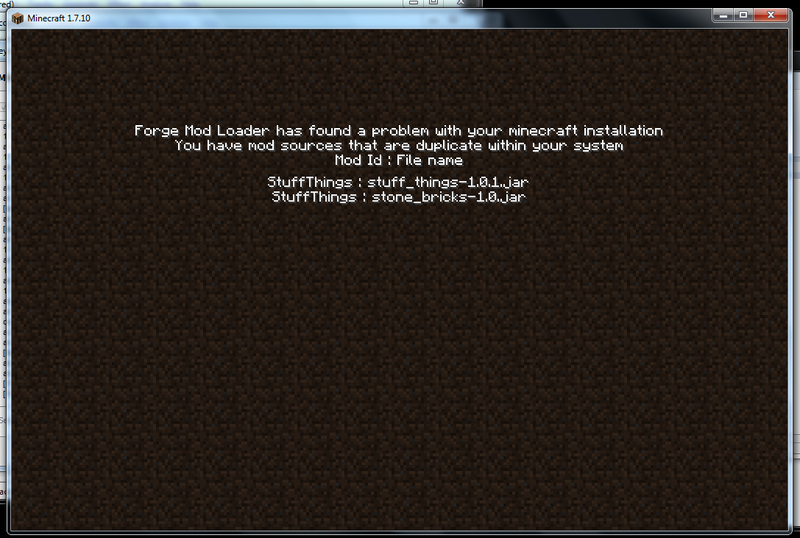 Unless I know what mod is causing it though, I unfortunately can't do anything. I thought it was possible some conflict like that would occur. It shouldn't take too much time to fix. Maybe a day or two. A fix for the stone bricks mod should be out sometime on saturday. About the mod compatibility, it shouldn't be hard to do. The mod acts as I would have suspected. Instead of having a new "type" of recipe, it simply has normal recipes that won't fit in a normal crafting grid. I will probably add compatibility in the next (big) update. EDIT: Patch coming out in 10-20 minutes. EDIT2: Patch for Stone Bricks Mod has been released. Re-download the mod from it's forum page. Location: That's a good question? Really cool mod, keep it up. Adds a bunch of nifty items and blocks! love it can ya make more mods like this? and can i use it for my modpack? Instead of making more mods like this one, I'm just gonna add more to this one. Yes, you can use it in your modpack. I always LOVE finding a mod like this. This looks complex and you have some talent, man! A while back cpw/LexManos added a way to use your real IGN under the Forge dev enviroment, it involves adding an argument (or two) when you launch Minecraft. That will be very useful! Thank you for telling me that! WARNING: This mod does not work in multiplayer. Fix coming soon.